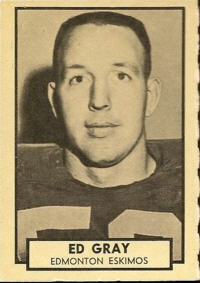 A graduate of Oklahoma, Ed Grey was drafted in the seventh round by the Los Angelas Rams of the NFL. 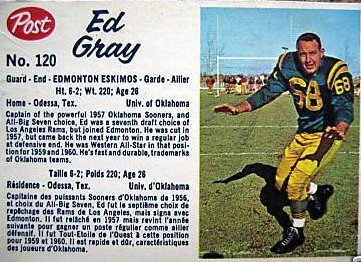 Gray chose to come to Canada, however, and played six years in the CFL as a defensive end, all with the Edmonton Eskimos from 1957 to 1962. 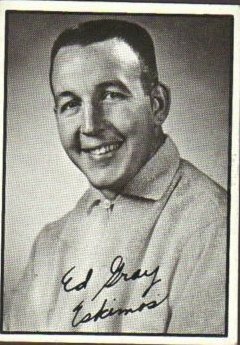 Gray was actually cut by Edmonton the first tiem in 1957, but returned to win a regular spot in 1958 and go on to be an all-star at defensive end, winnng two West selecitons at defensive end in 1959 and 1960 (there were no CFL All-Stars until 1962). Gray recorded five career fumble recoveries, returning two for touchdowns and had one career interception. No defensive tackle or quarterback sack stats were kept during those years.